PDL’s pre-assembled glass storefront doors are offered in a variety of finishes, glazing and hardware options, sizes and sidelites. They install just like our metal doors, and are applicable for metal, masonry or stud construction. Our glass storefront doors are available with single or double sidelites or transoms. 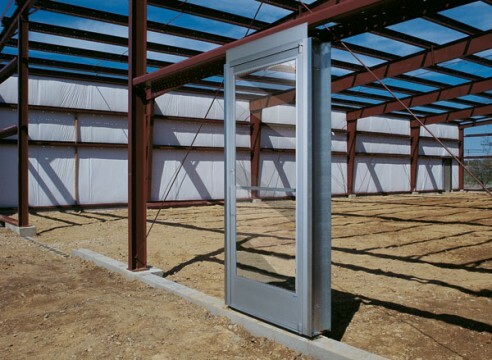 Doors can also be prepped for metal building installation or existing opening installation. Special sizes are available, too. These aluminum doors as well as the glass are manufactured by Oldcastle BuildingEnvelope®, which means you get the highest quality product in the industry. Buying your pre-assembled glass storefront doors along with your other exterior doors eliminates the need to add another name to an already long list of sub-contractors needed to be coordinated. All your exterior walk doors arrive together and can be installed by the same contractor. Both are available in tinted and/or Low-E options. For a list of all the glass storefront door components, click here.